When science professionals say that life is nothing but a never-ending circle, there is not a single point of that statement that we can disagree on if you train your thoughts to how a person progresses through the years. By the time he was born, he requires the assistance of others around him, as well as a nice supply of milk to strengthen his soft bones. The need for outside help in order to live returns during old age, and this is the time when milk supplement will be a necessity too. 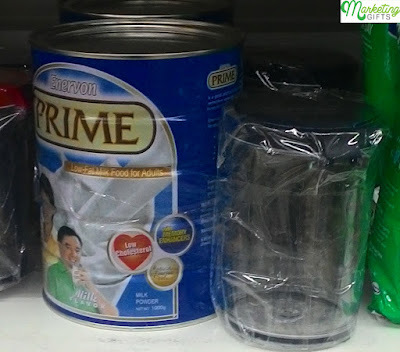 Hence, below is an Enervon Prime product with a special tumbler for adults. Connects to Regular Merchandise. Because the company manufactures powdered items that can turn into beverages with the addition of water, a liquid container definitely has connection to what they produce. For this reason, the promo gift can boost their profits. Increases Level of Convenience. The users can take their healthy drink anywhere. They can simply pour the milk in the gift with purchase and go out in no time. Heightens Consumers’ Memory. When family members are talking about the promotional tumbler, they will not say the ‘clear glass with dark blue lid’. There is a higher possibility that these people will refer to it as the ‘tumbler from Enervon’. This on-pack promotion right here boosts brand retention in customers’ mind. Business owners who obtain marketing strategies from the Marketing Gifts blog can advertise a business efficiently. Be one of them now.